They have large purplish red spots or marks, usually ringed with white, and often reticulate brownish background. 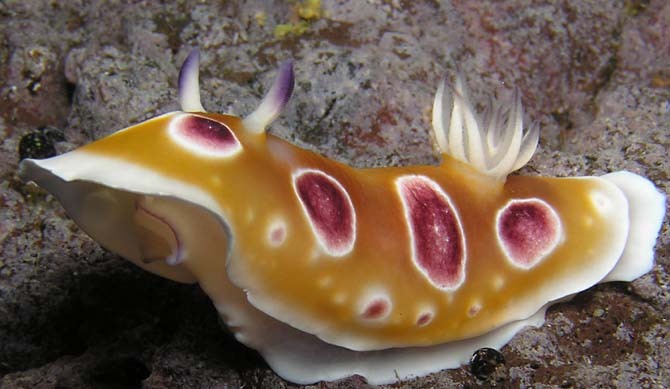 According Bill Rudman : " Specimens of Goniobranchus cavae from Reunion Island show an incredible range of variation, including forms in which the diffuse yellow-orange spots become browner and expand to form one large brownish patch. 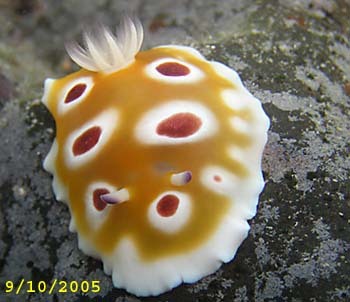 In the most extreme form of this pattern, the purple spots become fewer and much larger and all the mantle, except for a narrow white band at the edge, becomes a uniform yellow-brown background. 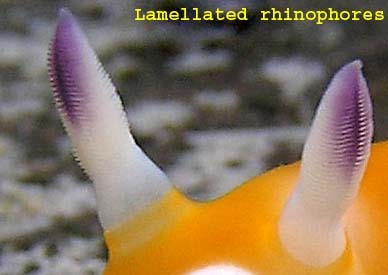 I had earlier separated specimens from South Africa with that colour pattern into a separate species which I called Chromodoris cf. geminus, but the photos we now have from Reunion Is, Mauritius and South Africa suggest that this is just an extreme colour variant of G. cavae. I could of course be quite wrong, but for those who believe in parsimony, this seems to be a much more parsimonious hypothesis than 5 or 6 new species. " 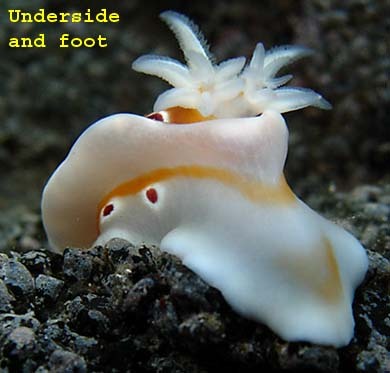 Valda Fraser's shows that this species has the more usual waves of movement down each side of the mantle.Not the very distinctive behavioural characteristic of G. geminus, for which the mantle edge is raised and lowered in one movement all around the mantle edge. 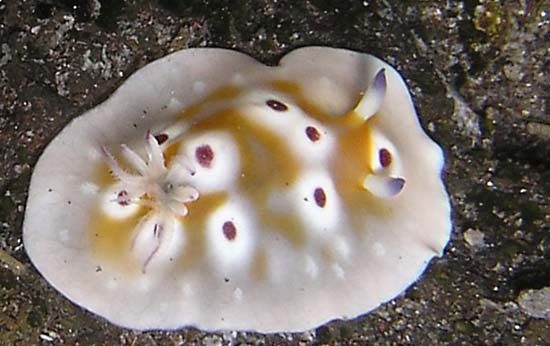 This is one of a group of similarly coloured species which includes Risbecia tryoni, Goniobranchus leopardus, Goniobranchus cavae and Chromodoris cf geminus. 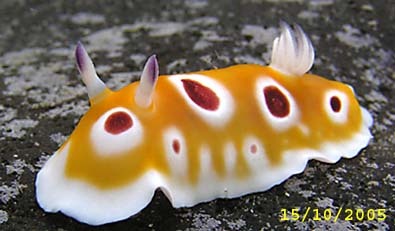 The rhinophore clubs are brown. 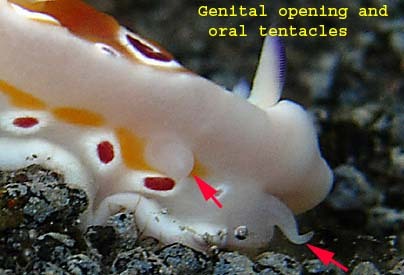 High shape of the body, with a reduced mantle overlap. Flat body shape with a wide mantle overlap. Large dirty brown central patch with uniform brown-purple round spots usually ringed with white. Large brownish central patch with large purplish red spots or marks, usually ringed with white. 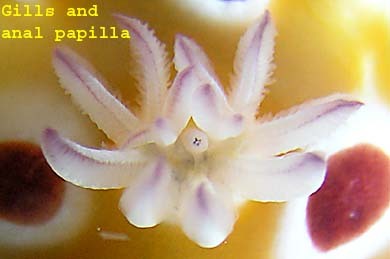 Pattern's modification of one specimen from 9 October to 8 November 2005. This specimen was found with two other on the same area during this period. Reunion, Etang salé les bains, on a rocky coast, 16 October 2005, size : 20-25 mm. You can observe submarginal mantle glands by transparency found all around the mantle. Reunion, This species has the more usual waves of movement down each side of the mantle.Not the very distinctive behavioural characteristic of C. geminus, for which the mantle edge is raised and lowered in one movement all around the mantle edge. 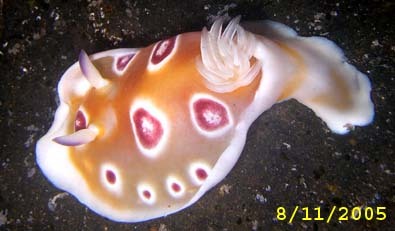 Mauritius, Chromodoris cf.geminus, at Pereybère , by Marina Poddubetskaia.